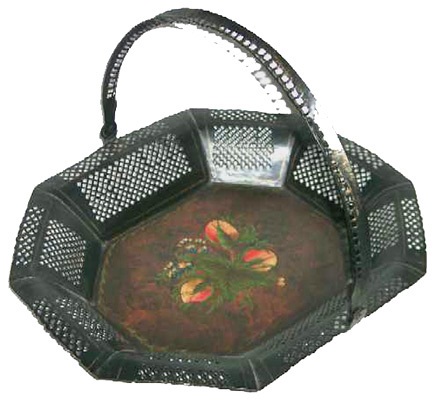 Presented here, a gorgeous Pontypool, Welsh "Black Iron" Basket, circa 1760's, repainted in the 1800's. See Pp. 195 thru 200 in Mitchel's Antique Metalware. Page 198, Fig 1 shows like piece (minus handle) from Pontypool, Wales, c. 1760 by John Allgood, founder of this line. This Octagonal basket with reticulated sides is 11" x 13" x 1-1/3" h. with the handle down and 8" high with the handle up. Condition is very fine.